This data tool allows you to access data for a single institution in summary format or as reported on the survey form. For all first time tasks within the Data Center, except Customize DFR, you will be asked to indicate the type of data you wish to access: Preliminary/Provisional Release Data or Final Release Data. 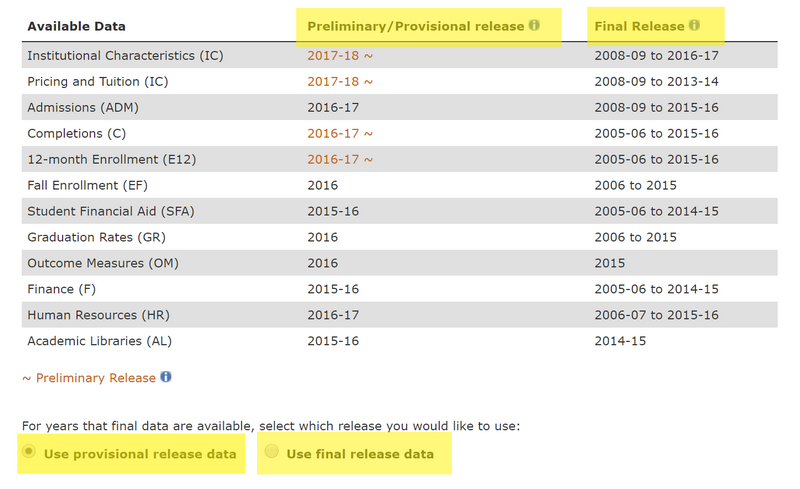 This option allows you to access either Provisional Release Data or Preliminary Release Data (only available for most current collection year). This option allows you to access Final Release Data. Final (Revised) Release Data are data released the year following the initial collection, after institutions have been given an opportunity to revise their data if they believe it was inaccurately reported in the prior year through the IPEDS PYR System. Final release data can be used when the most up to date data are required; however, these data may not match the tables from the NCES First Look publication. To view complete instructions on Create, Save, or Upload institutions, please click here. Once an institution has been selected, the following links will be available at the top of the screen to navigate between the options for retrieving data. This option allows you to view commonly referenced IPEDS data for the selected institution from the most recent data year. By default, this report is automatically displayed once an institution is selected. Click on one of the available subject areas to view the data within that category on-screen. This option allows you to view and print IPEDS data for the selected institution as reported in the original survey forms. When the Reported Data screen opens, start by choosing a data year from the list on the left side of the screen. Next, click on the desired survey component to view the actual survey forms completed by the selected institution during the specified data year on-screen, as shown below. From this window, you may print the survey forms or download the survey in a printable, PDF format. When finished, click the X button to close this window and return to the main Reported Data screen. This option allows you to view the list of available DFRs for the current institution. Released annually, the IPEDS DFR is intended to provide institutions with a context for examining their reported data. The report compares institutions with either a custom-created or NCES-generated group of peer institutions based on a wide-range of IPEDS survey data. The available years of reports are presented in a printable, PDF format. Click on the corresponding link to view/download the IPEDS DFR for the desired year. For detailed instructions on how to create a customized DFR, please refer to the Data Feedback Report section. Within each of the above options, you may click on the Main Menu link at any time to return to the Institution List and retrieve data for another institution in the IPEDS universe. When finished with this task, use the Main Menu to navigate to a different task in the Use the Data portal; or, click on Start Over from the navigation menu at the top of the screen to end the current session.